Obama Did Fundamentally Transform the United States of America! | What Did You Say? We are five days away from fundamentally transforming the United States of America! What? Barry the Earth Whisperer would single-handedly heal the planet AND give us all free cell phones? Huckster Obama and wife, who said after Hubby Hope-and-Change was inaugurated, “And let me tell you something — for the first time in my adult lifetime, I am really proud of my country,” …transformed things alrighty. Obama used his pen and phone to draw red lines and subsidize the failing solar industries and to flood the military with new rabidly pro-LGBTQ personnel and guidelines, to invite men who called themselves women into the bathrooms with your wives and daughters. Imagine that. We all hoped he would change, but he did not. Barry’s legacy was a behemoth health care system which compelled people to sign up or be penalized. Hmmm. The Mafia did that back in the day…didn’t the U.S. purge itself of racketeering decades ago? Obama’s “accomplishments” are too numerous to list: the but Hope and Change America got from #44 was not what any but an avowed Marxist pervert ever wanted. 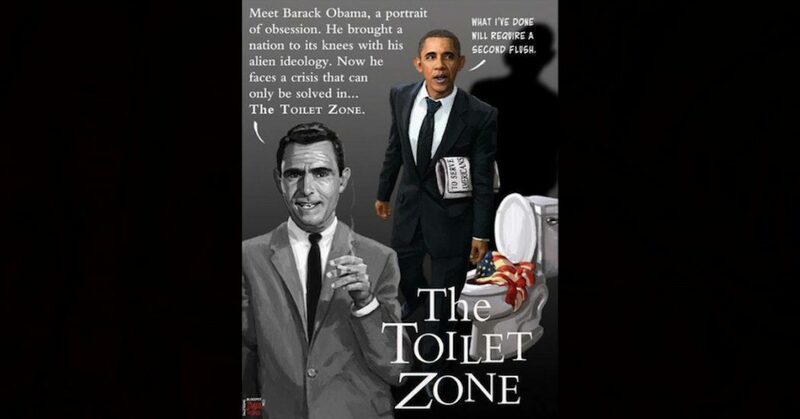 Thus The Twilight Zone parody is perfect. Our current president is far from perfect, but he does love America and Americans. Trump is not booking apology tours and kissing up to baby-killing Planned Parenthood. #45 reveres the U.S. Constitution, and honors our military. Finally, maybe, just maybe, the millions of patriots who love America and her Constitution can hope for real change. Constitutional change that supports the dreams and aspirations of hard-working, LEGAL American citizens.